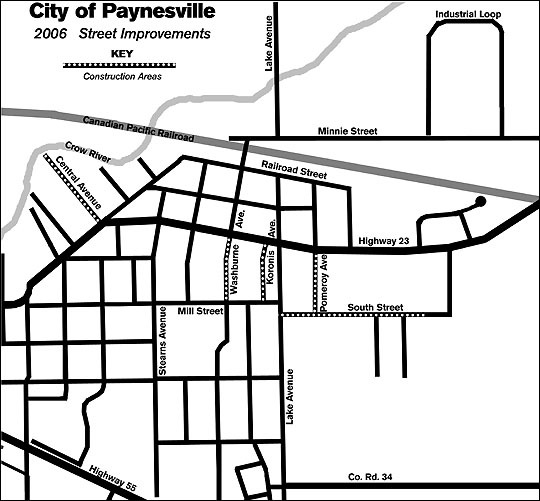 Work on the city's 2006 Street Improvement Project is set to begin in April. Work on the city's 2006 Street Improvement Project is set to begin in April. Washburne Avenue (from Highway 23 to Mill Street), Koronis Avenue (from Highway 23 to Mill Street), Pomeroy Avenue (south of Highway 23), and South Street (from Lake Avenue to just past Morningside Avenue) are all scheduled to be rebuilt: sewer and water lines replaced with new pavement and curb and gutter. Central Avenue will be overlayed with a new tar surface. No detours are planned during the street project, but only local traffic should use these streets. The project will start with the deep utility work (sewer and water mains and lines) which will inconvenience some homeowners in the affected areas and will make the streets temporarily unpassable. After the deep utility work, the streets will remain gravel until the first layer of tarring (hopefully by mid-summer). Affected residents will also be warned when the concrete sidewalks are poured by their houses. The concrete needs several days to cure without being driven over early this summer. The contractor is R.L. Larson of St. Cloud. Affected residents should receive periodic newsletters of the project progress from new city engineer Bolton & Menk, Inc., of Willmar. The city realizes that residents are inconvenienced during the street project and appreciate their patience and cooperation, said public works director Ron Mergen, also interim city administrator. Anyone with questions or concerns about the project can contact Mergen at city hall at 320-243-3714.